This Desktop Converter has the same functions as other Eureka Ergonomic Desktop Converters, it only costs much less. You can get maximum workspace from a compact footprint (24 5/8" W x 23 1/4" D). 30-Day Risk Free Return Guarantee, we will also help to quickly arrange your return within 24 hours, free of charge. Try our product risk free while you make your final decision. Best in Class Service and Support: Our Service Team is available 24 hours a day to assist you with your product issues and support. Simply squeeze the handles and let the converter do the work for you, raising your desktop converter to your desired height with very little effort. You will fall in love with the smooth and effortless opperation of this standing desk converter after just one use. 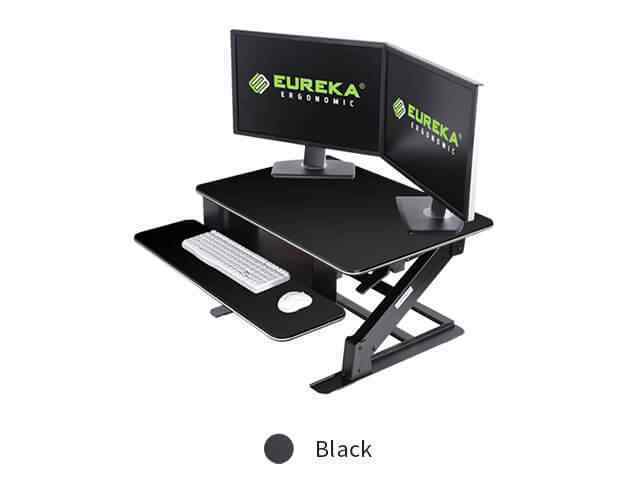 Stand out in your office like we stand out from the competition with the Eureka Ergonomic Standing Desk Converter. 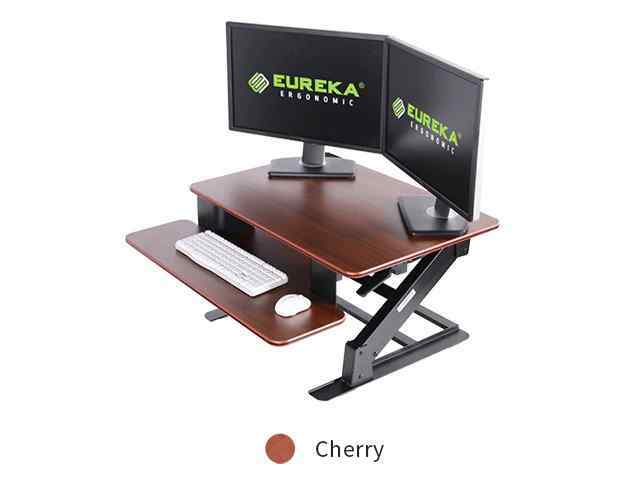 Stand Up For Your Health and Success With Eureka Ergonomic! 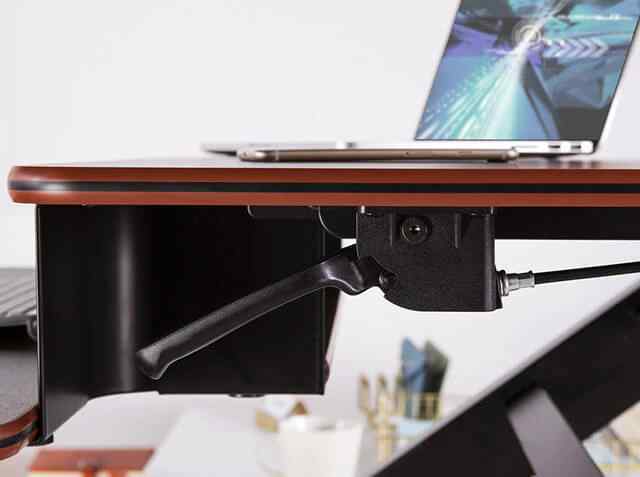 We use a patented gas strut mechanism which is vastly superior to the spring lifting mechanism in other standing desk converters. The gas strut mechanism offers you the most silent experience possible with almost zero noise. Our 32" Sit-Stand Desktop Converter has a usable area equivalent to what you would expect to get from most 36" models. The extra space means that you can support dual monitors on a 32" desktop converter. Don't forget about the second tier! Ours are large enough for a full size keyboard with enough room to work with your mouse comfortably. YOUR WORK/ LIFE BALANCE IS JUST A CLICK AWAY! Our desktop converter will hold up to 35 lbs. and can accommodate up to 2 monitors measuring 30" each when using dual monitor arms and up to 2 x 21" monitors without the monitor arms. 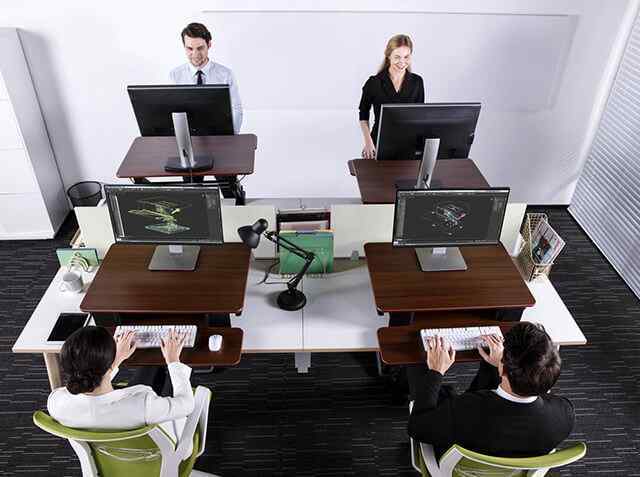 assuring you the best ergonomic fit. Eureka ranks 33% higher in performance than the top competitors in the market.